Will this bullet fire from the Hatsan Hercules? And if not, which pellets/slugs etc. will? What about SINGLE FEED in the Ataman M2R ? Hey will these work in the Senaca Recluse 357/9mm. Will these fit the Hatsan BT Big Bore Carnivore? Will the Dan Wesson 25ct pellet-bullets fit the SNR357? Hi can use this pellets in Ataman M2R Tact Carbine Type 1 Air Rifle 357...??? No. You may damage the riffle. Would these work in an "AirForce Texan Big Bore 9mm/357"? 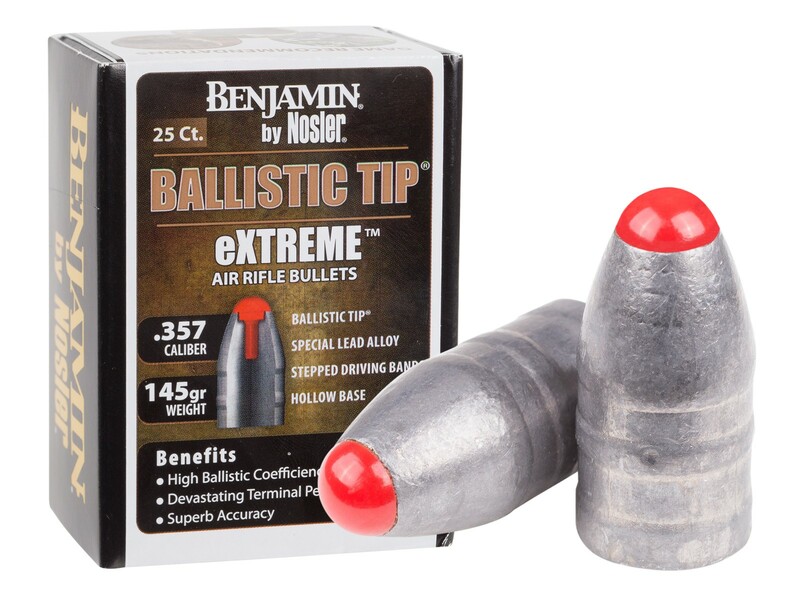 How the hell are we to buy, if you won't answer important questions on weather the ballistic benjemin extream tip will fit the Evanix sniper ? Will these fit the mags for the evanix sniper, 357 cal. + 45cal., 50 cal. Does Crosman have a single shot tray in the works for the Benji Bulldog? Not that we are aware of at this time. Without the clip, what is maximum bullet length you can feed into the Bulldog by hand? We have not tested the maximum length that can be inserted, but if you are hand feeding the projectile please be sure it is centered to the bore when inserting to keep from damaging the breech seal. Can I use these pellet on a Evanix Sniper Rifle? The ammo would be too long for the Evanix magazines.